Certain criminal convictions can result in the loss or permanent revocation of a driver license. Felony DUII and a third conviction for DUI (after DUII Diversion) are examples of charges that will result in a lifetime revocation of driving privileges in Oregon. Obviously, the loss of driving privileges can have an enormous impact on daily life. Routine things such as obtaining a job, getting to work, groceries, child-care — all present new challenges. 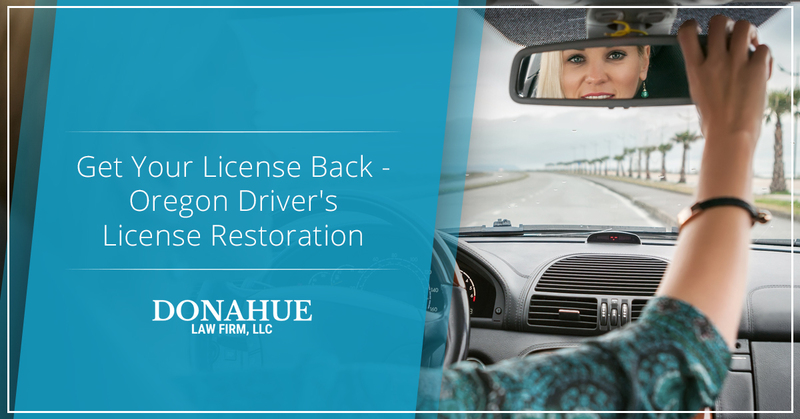 Fortunately, it is possible to restore Oregon driving privileges in certain situations and a DUII attorney at Donahue Law Firm can help get your license back. In Oregon, if a person’s driver’s license has been revoked for life for DUII related convictions that may not be the end of the story. Under the right circumstances, a person may be eligible for reinstatement after 10 years. Certain factors related to conviction date, probation, and subsequent motor vehicle-related convictions may affect the specific timing of eligibility for reinstatement. A knowledgeable DUII attorney should know if and when you are eligible. A DUII lawyer at the Donahue Law Firm can assist you in restoring your license and getting you back behind the wheel. Restoring driving privileges can be challenging and what follows is a simplified overview. In order to restore driving privileges after a permanent revocation, a petition must be filed in circuit court and a hearing conducted. The petition must seek an order from the judge restoring the person’s privilege to drive. Following the filing of the petition, a hearing will be held to determine whether the petition will be granted. At the hearing, the Court will consider a number of factors. Among others, these factors include the nature of the offense that resulted in revocation, and other criminal and relevant noncriminal issues related to the petition occurring both before and after the revocation. In order to prevail at the hearing, the person seeking their license must provide substantial evidence to show all factors are satisfied. Not surprisingly, the entire process is usually handled by a DUII attorney skilled in driver license restoration. The Court will only order restoration of driving privileges if certain criteria are met. The Court must find that the petitioner is rehabilitated, does not pose a threat to public safety, and has completed an alcohol/drug treatment program (if required by the revoking conviction). The Court will only order restoration if these criteria are met by a showing of “clear and convincing” evidence. Clear and convincing is a high standard requiring careful and strategic attention to the process and presentation of the evidence. If the burden is met, there is one more hurdle before you can get your license back. If the Court orders restoration of driving privileges, the Department of Motor Vehicles (DMV) will not reinstate an Oregon driver’s license until the person seeking the license complies with future responsibility requirements. If you or someone you care about has lost their license, we can help. From determining whether or not you are eligible to get your license back, to navigating the restoration process and getting your license back in your hands, we know how to get the job done. At the Donahue Law Firm, you benefit from our extensive experience handling driver license suspensions with the DMV and Courts.